Custom Barrel Head Lazy Susan made from a "Real" barrel head. Size: 21" round I..
Barrel Head serving tray with custom design. Made from a REAL barrel head. Select handle styles Stee..
Carved from a solid piece of acacia, the Bruschetta features a removable bread crumb tray and a .. The Carovana features a nested set of three beautiful acacia bowls, each with its own tempered.. The Carrara is an oval-shaped acacia cheese board with a removable marble top. Three full-tang..
Hand-Carved Barrel Stave Glass Bottle Holder (P/N BNGH-2). His woodshop is surrounded by vineyards l.. The Heart cutting board and tool set is so elegant in its simplicity and design, it bodes well n..
Laguiole Flatware Stainless/Ivory by Jean Dubost Set of 24 (P/N (JD07/13152.IVO). Each blade is hand.. The Mesavino is a beautifully hand-crafted solid bamboo table with carved-out sections to hold..
An oversized acacia salad bowl with two contoured serving tools that sit flush inside the bowl..
Oliera means oil in Italian, and olive oil is the staple of Italian cooking. The Oliera featur.. Oval Slate Serving Board (P/N S6-003). Let your guests know what they are about to enjoy by wr.. This stainless steel Wine Glass Drying Rack conveniently and securely air dries 12 stems at a time, .. This stainless steel Wine Glass Drying Rack conveniently and securely air dries 6 stems at a time, e.. The Quarterback cutting board and tool set is a 15" x 8.75" x 1.5" board made o..
Rectangle Slate Serving Board (P/N S6-001). Let your guests know what they are about to enjoy .. Recycled Wine Bottle Tea Lights - Set of 4 (P/N 4881). These tealight candle holders make a gr.. The Regalio is an original design by Picnic Time. 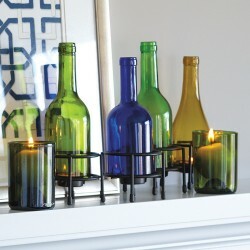 It is a three-tiered combination serving tra..
Wine Bottle Votive Candelabra (P/N VOT001). Each candelabra displays 4 votive candles in a cle..
Wine Glass and Bottle Salt Pepper Shakers (P/N 17298). Charming and practical, these glass sha..